In the wake of the apparent self-destruction of the Forerunner empire, two humans - Chakas and Riser - are like flotsam washed up on very strange shores indeed. Captured by the Master Builder and then misplaced during a furious battle in space, they now find themselves on an inverted world where horizons rise into the sky and where humans of all kinds are trapped in a perilous cycle of horror and neglect. They have become both research animals and strategic pawns in a cosmic game whose madness knows no end - a game of ancient vengeance between the powers who seeded the galaxy with life, and the Forerunners who expect to inherit their sacred Mantle of duty to all living things. Since this is the second book in the Forerunner saga I’m going to try to be as vague as possible to avoid any major spoilers. I highly suggest that you read Halo: Cryptum first or skip to the verdict if you want to avoid any chance of spoilers. Halo: Primordium continues on directly after the events in Halo: Cryptum and focuses on one of the human characters, Chakas. Chakas finds himself stranded on a severely damaged Halo ring where he meets up with another group of humans who have lived their entire lives on the Halo. Together with two of these humans, Vinnevra and Gamelpar, he traverses the Halo in search of his lost companion, Riser, and a way off the ring. Chakas has to face many obstacles and during his journey he makes surprising discoveries about himself, the Halo and the machinations of the Forerunners and The Primordial. The story is told in a first-person narrative from the viewpoint of Chakas and throughout the story we get a much more intimate glimpse of him and the warrior personality, the Lord of Admirals, imprinted in his genetic material. Chakas is a tragic figure, never quite in control of his own life and he is always being forced along the paths chosen for him. You can’t help but sympathise with him and wish for something good to happen to him. Initially the pacing is quite slow and I found it frustrating at times. Most of the first half of the novel is taken up with their journey through the Halo. The characters stumble from one place to the next in a constant need to find food and shelter. While doing so there are striking descriptions of their surroundings, chance encounters and various conversations through which the history of the Halo and other essential background is revealed. There’s a lot of ground to cover and I think Greg Bear does an admirable job of balancing story progression and back-story which is a very difficult task given the huge scope of the Halo universe. The second half of the novel is a well-deserved reward for persevering and that’s where Primordium truly shines. There are some more startling revelations; stunning twists; a very poignant moment; and a cliffhanger ending that thrusts the ancient past firmly into the present-day Halo universe. Halo: Primordium continues to delve into the history of the Halo universe offering quite a few surprises along the way. Die-hard Halo fans will definitely love discovering more about The Flood, the Precursor and what Chakas ultimately becomes. The cliffhanger ending also gives an enticing glimpse of how the story might tie in with the forthcoming Halo 4 game. More casual readers might find the slow pace a bit daunting, but it’s well worth persevering till the end. If you are looking for an action-packed adventure then you'd be better off looking at some of the other novels in the Halo franchise. 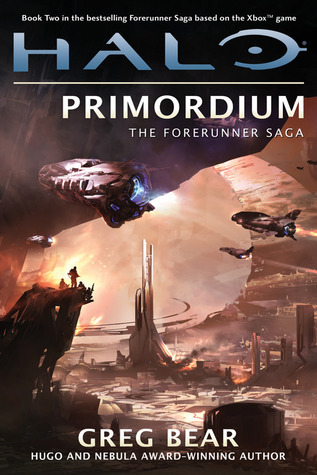 Despite the slow pacing I managed to enjoy Primordium and I can’t wait to see how things turn out. Hopefully the third and final installment will answer a few unresolved questions and deliver a far more action-orientated storyline. Recommended. 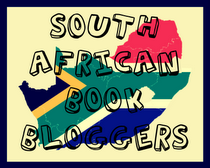 Thanks to Kelly from Pan Macmillan S.A. for providing the review copy. In order to make up for not buying any books in January I went slightly overboard this month. 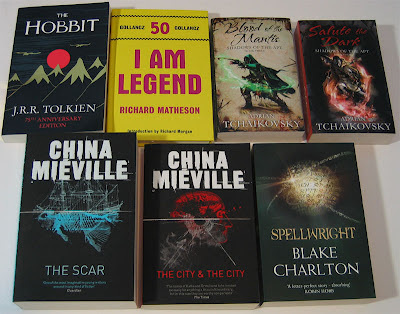 It seems all the local online shops decided to have sales at the same time, and since I don't get to actual bookshops very often I just had to jump at the opportunity. 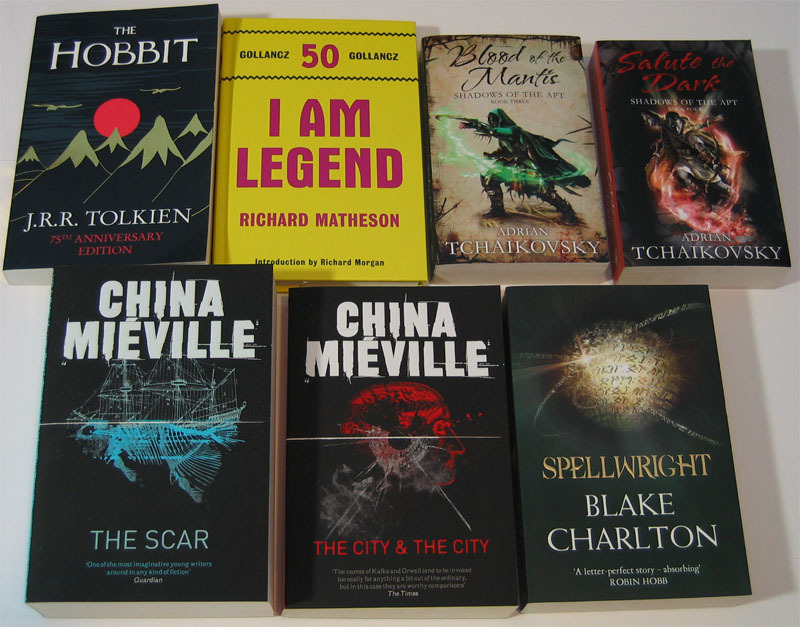 I'm pretty happy that I managed to control the darker urges of my book addiction and kept the number of new books bought down to just seven. 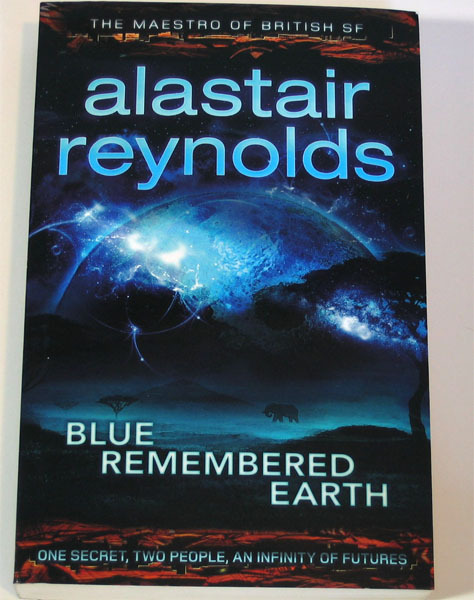 Feast your eyes on the gorgeousness that is Blue Remembered Earth by Alastair Reynolds. Isn't that cover just stunning? This is one of my most anticipated titles of 2012 and I can't wait to get started. 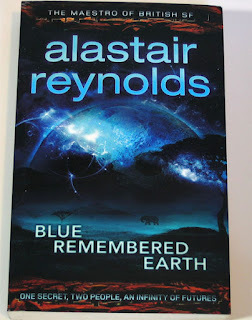 A huge thank you to Andrea from Jonathan Ball Publishers for sending me a review copy. The Polity Collective stretches from Earth Central into the unfathomable reaches of the galactic void. But when the Polity finally encounters alien life in the form of massive, hostile crablike carnivores known as the Prador, there can be only one outcome - total warfare. Chaos reigns as, caught unawares, the Polity struggles to regain its foothold and transition itself into a military society. Starships clash, planets fall, and space stations are overrun. But for Jebel Krong and Moria Salem, trapped at the center of the action, this war is far more than a mere clash of cultures, far more than technology versus brute force. This war is personal. One sunny day in 2008 I was perusing the donated book section of my small local library in search of some science fiction to read. I had already exhausted all the offerings in their normal collection so almost anything would do. Squeezed in amongst the stacks was this little book called Prador Moon by someone called Neal Asher. The cover looked science-fictiony enough so I grabbed it and headed for the checkout counter without even reading the blurb. That ‘little’ book simply blew me away. 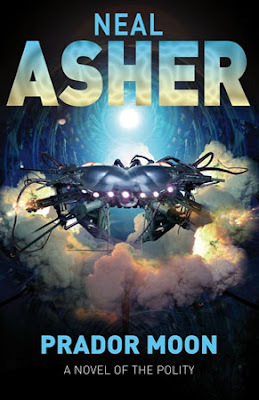 I was astounded at the scope and complexity of the futuristic world crammed into just 222 pages and I loved every minute of the action-packed bloody encounters between the Polity and the Prador. Four years later I found myself in dire need of some ‘bloody mayhem’ to take my mind off things and Prador Moon was the first book that came to mind. Revisiting old favorites can sometimes be a huge disappointment since they never quite seem to live up to that experience of first discovery. I’m glad to say that after all those years Prador Moon still managed to enthrall and thoroughly entertain me. All the elements that hooked me the first time round are still there and just as effective as when I first read it. What drew me to the story was the technology and ideas at play. The AI controlled society of the Polity, the monstrous crab-like Prador with a penchant for human flesh, the war drones and golems, human-bonded spaceships, fantastically destructive weaponry and the flawed human characters all come together to tell one heck of a story about inter-species conflict on a truly vast scale. Prador Moon was my first introduction to Neal Asher’s work and made me a lifelong fan. The premise might seem somewhat over the top and simplistic at first glance. Yes, nasty aliens attacking humanity has been done countless times before, but what sets Prador Moon apart is how that simple premise is morphed into something much more complex by bringing some very interesting concepts together. Prador Moon packs a vicious punch. If you are looking for a fast-paced, action-packed read and you aren’t afraid of blood and gore then this should satisfy nicely. Highly recommended. Now let’s go make some crab cakes! Procrastination provides solace for a weary soul. What can be more comforting than the knowledge that you can put something off for yet another day? That's my excuse and I'm going to stick to it! I've been so busy with other things that this new arrival post is more than two weeks overdue. So, before I get lost in yet another bout of procrastination here's the latest batch of books I received. I ordered these from Better World Books just before Christmas and they arrived a week before the end of January (yes, this post is THAT late). 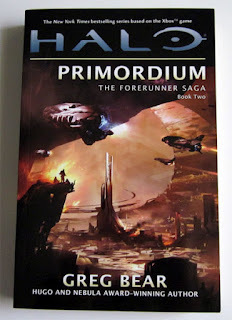 Pan Macmillan SA was kind enough to send me a review copy of Halo: Primordium the second novel in the Forerunner series. Isn't that cover just amazing? I can't wait to get to it. Thanks Kelly! On the reading front things are tough. I'm a month behind in my reading for the Wheel of Time challenge. I'm currently busy with book four, The Shadow Rising, and need to read book five, The Fires of Heaven, by the end of the month in order to get back on track. Those books are tomes, so I doubt I'll manage it. If you're a military history geek, you've probably heard the origin of the Gatling gun. Designed by the American doctor Richard J. Gatling in 1861, he figured the multiplied firepower from a single weapon would reduce the demand for massive armies and large, set-piece battles, and ultimately show the world's leaders the savagery and futility of war. Enter the American Civil War with 620,000 dead; more than the total American losses from every conflict from the War for Independence to Vietnam. Combined. What about the theory of long-range, large-scale strategic bombing that was developed after the appalling carnage of World War One? Strike at vital war-making centers, shorten the conflict, save lives, right? Unfortunately the theory didn't quite play out as expected a quarter century later, as the residents of London, Tokyo, Berlin, and other cities can attest. Take as an example the city of Dresden, Germany, on which Allied bombers dropped almost 4,000 tons of explosives over the course of two days, demolishing 15 square miles of the city and an estimated 25,000 German civilians. Remember when television and the internet were touted as world-changing educational tools that would raise the collective intellect of Mankind? It's the thought that counts. I guess. The staple of Science Fiction is the notion that Society and Humanity will advance with Science and Technology. All Mankind needs is FTL or nano-tech or faster broadband, and eventually, inevitably, we'll be lifted beyond the meat, the mud, the divisions into a new, enlightened phase of human existence in which we can boldly go where no man has gone before. Nice idea. Only trouble is history says otherwise, with repeated tragic eloquence. Let me be clear here: I'm not a scientist or sociologist. I'm just an debut author offering thoughts on constructing realistic science fiction settings, so sprinkle your grains of salt liberally as you read. Your mileage may vary. Whenever I approach a sci fi story as a writer, my foundational premise is this: Technology won't carry Humanity beyond itself; it merely creates new avenues of expression for what we already are. So will nano-tech processors that can build anything imaginable given enough raw material eliminate economic disparity? Probably not. Sure they'd be revolutionary and incredibly beneficial. Absolutely true. But the first agenda of the powerful is to maintain power, so if you think people won't construct value systems and some form of currency that enables them to accumulate influence, affluence, and social distinctions, you're fantasizing. Occupy Proxima Centauri! Good Luck with that. 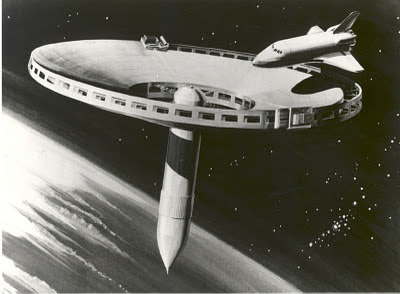 Rather than envisioning a Worker's Paradise In Space, I think the real challenge for the Spec-Fiction writer is to hypothesize regarding that future economy's mechanisms and how they impact society and individuals. Who will be the new Power Brokers, Refugees, Luddites? What drives them? What scares them? If History is any indicator, Humanity is hard-wired against Socialist Utopia. People have equal value but not equal abilities. Cybernetics, bio-tech, gene-therapy will certainly be used to off-set disease and disabilities, but they will also be employed to increase those distinctions. Someone will always strive to be stronger, faster, smarter, ahead of the curve. The issue isn't the Body, it's the Heart. Technology is simply a new appendage. 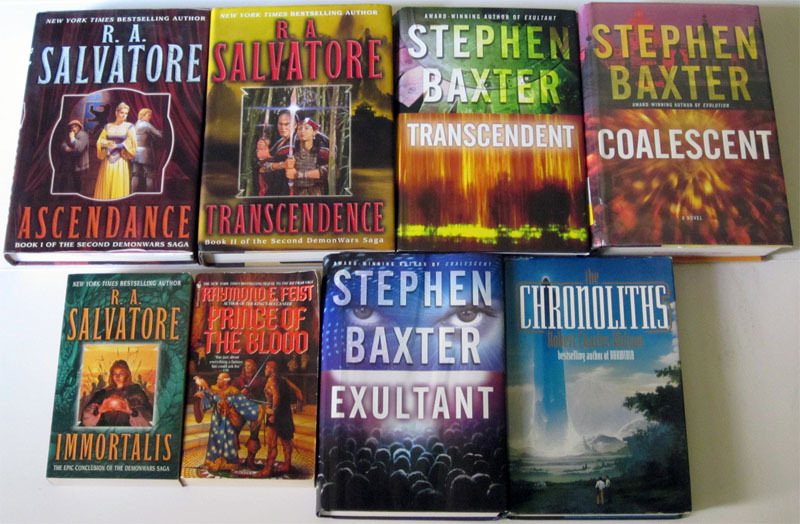 In my opinion, the second important premise of good science fiction is that it isn’t about fictional science. Fact is, I loathe books that read like a doctoral thesis. Ark ship to Gliese 581c? I'm not interested in a physics-contorting treatise on practical FTL travel. I want to see people dealing with relative aging, extended space travel, leaving Earth and all known references behind for an alien planet, not read page after page detailing viable cryogenic hibernation or sustainable eco-systems in deep space, low-grav arcologies – except to the extent they apply to the characters in your story. Scientific theory may titillate the more cerebral reader, but people read fiction for more visceral reasons. Good fiction that strikes that primal chord is about people’s struggles, their failures and triumphs. Good science fiction (IMO) is about people wrestling with the new iterations of those issues in the face of advancing technology and discovery. Any prescience in speculative fiction is the result of asking the right questions and discerning what impulses really move us as human beings. I agree wholeheartedly, and confess that's my ultimate target every time I write. I think one of the most mysterious yet infuriatingly recognizable feature of any century, any locale, any culture will always be the human heart. A while back, I saw author Cory Doctorow on a Google interview and he said all futurists really did was throw shovelfuls of the present at the big gaping unknown around the next bend. Guilty as charged, yer Honor. The third thing I do is shove current trends off the edge. I extrapolate. So whether it's another model of the M-series assault rifle, the dramatic rise of private military contractors, the exponential increase in robotics and remote-control drones in every field, or the latest U.N. numbers on the amount of people who don't even have clean drinking water, (estimated 1 billion as of this writing, or one out of every seven people on the planet.) expanding common denominators makes the background familiar yet foreign. I find this facet the most fascinating to research. I end up with pages of notes, video references, hyperlinks, and a fairly long reading list. Sometimes explained, mostly hinted at, all of it goes into the backdrop that forms and frames the characters. As I close, of course you're free to disagree and find exceptions. You read what resonates with you, and you have to write what moves you. I keep coming back to the notion authors are called to tell stories that fire the imagination, not deliver lectures that notify the intellect. Those are lectures, sermons. Fiction certainly can and does inform, but it's a horse of a different color. As far as constructing realistic fictional settings, I believe they are rendered most convincingly not when they're holding up not a "window into the unknown", but a mirror angled further down the road. Whether we take comfort or warning depends on what we see, but we must remember part of the image is a reflection of right now. Should Humanity expand into our solar system and beyond, the simple fact is we’ll bring ourselves with us. Our elemental struggles will continue in different skin, under different stars. If justice, compassion, peace and genuine civilization prevail, it's won't be owing to robots and networks but because we carried them with us, and struggled mightily to establish them. Patrick Todoroff's debut science fiction novel, Running Black was published in 2010. His next installment in the Eshu International series, Shift Tense, is nearing completion and should be released this year. To find out more about his work head over to Pattodoroff.com.